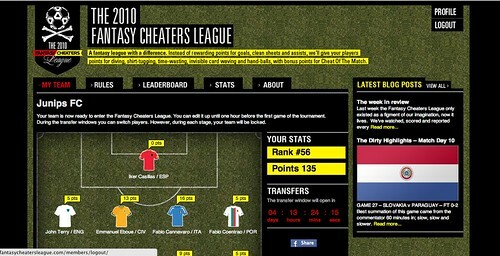 This FIFA World Cup features the usual array of cheats, drama queens and bog standard klutzes on the field. 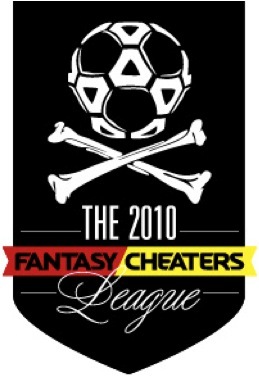 So it is overdue that someone offers a fantasy league for the ugly masters of cheating: The FCL. Our friends from across the road, HOST have spared no over time to not only watch all games, but also around 20 people note and analyze with bleary eyes what goes on behind the back of the referees. Not that the guys in black are having a particular successful time anyway. Firstly, I find agency initiatives like this are a sign of a healthy internal culture – and that builds a good reputation and attracts as well as retains the best talent. They are doing it for fun because they love football and because it deserved to happen. Secondly, quick, off-the-cuff projects like this (and without a real client) allow you to showcase abilities in strategy, creative, digital, social media… you choose what you want to show off in as core competencies. And apparently with 2 weeks of development time in the case of the FCL you can also prove how agile you are. Thirdly, you might be lucky like HOST that brands came on board once they’d built it. Skins sportswear because it fits with their brand positioning of Cheat Legal and radio station Triple M because they found it funny and appropriate for their audience. Without any media budget the word got out through classic PR and blogger outreach – targeted football communities, influential bloggers, the Irish (as major victims of hands-on rule interpretation they were very receptive). The essential integration across platforms (Twitter, Facebook, blog) was important to distribute content, facilitate conversations, and recruit people into the campaign. Strategically, there’s an interesting human truth at its core. The World Cup isn’t just about the football – the cheating and (lack of) gamesmanship causes just as much conversation and discussion amongst fans, gets the public involved, and can last long after the goals have gone. How Les Bleus got through to the South Africa and how then Thierry Henry (“Hand of Frog”) and his fellow drama queens managed to implode and eliminate themselves proves more memorable than a lot of game results. Preliminary results: 33,000 visits, 2,500 people from over 120 countries around the world playing the game, 430 mentions in social media, and some nice coverage form traditional media as well (several radio stations and The Age picked up the story). As they themselves put it: “What could a big global brand (and media budget) have done with this cheeky idea?” Does anyone know of a similar campaign going on right now?